Private flute lessons in Leander, Cedar Park, Georgetown & Liberty Hill. HitMaker Music School Leander is proud to offer flute lessons for students in Leander, Cedar Park, Georgetown & Liberty Hill, Texas. Flute lessons provide the opportunity to learn music on one of the oldest instruments. As a matter of fact, the oldest flute discovered was 43,000 years old. The flute is part of the woodwind instruments family, the sound is produced by blowing air across the embouchure hole. This takes practice to get it just right, but once a student understands how to make sounds, they can excel. At our music school, students learn about the history of the instrument, and how to play the instrument starting with the fundamentals. In private flute lessons, our instructors are teaching students real songs from multiple genres of music in an effort to expose students to new styles. We believe that expanding overall musical knowledge will contribute to student lives in years to come. 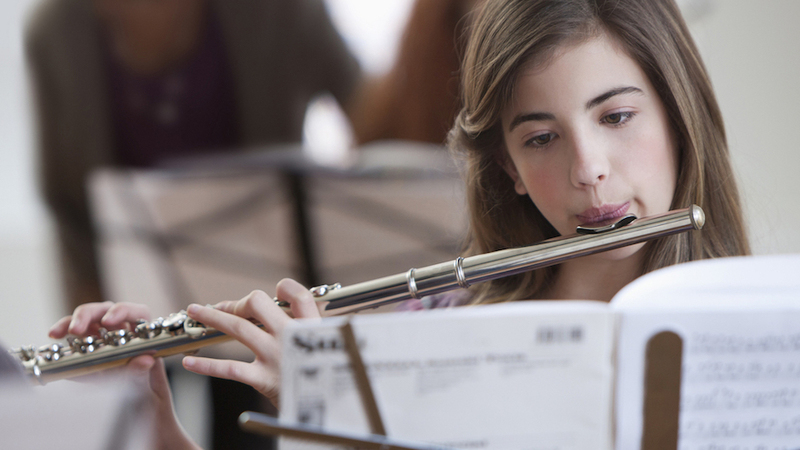 Students taking flute lessons can join ensemble groups to perform with others. We encourage everyone to perform in our recitals on the Red Oak Stage, even at a very rudimentary level, thus, providing short term goals and motivation. Please contact us to enroll or schedule a tour. Flute lessons, piano, guitar lessons, bass, violin, voice, cello lessons, mandolin, banjo & ukulele. We offer lessons in a relaxed home with a family friendly environment serving Cedar Park, Leander, Liberty Hill, Round Rock and Georgetown, Texas.